A big sign of excess estrogen? A “padded” body. Thicker arms, shoulders and hips. Often (once past the teenage acne stage), beautiful skin–plump with a certain “sheen” to it. I can often just look at a woman–younger and older (even post menopause) and, by her appearance, guess if she has excess estrogen. Thus far, when I visit with a female and ask her questions regarding her symptoms, she is often surprised I know without her telling me. Your doctor will help you? While I would like to pat myself on the back (so far my batting average is 100%), truth be told, it’s not rocket science. It’s not hard to guess-from her appearance AND from the average female today–that she has painful periods…or fibroids or infertility, precocious puberty or miscarriges, PCOS, Endometriosis. All of these are symptoms of excess estrogen.So…if I, as a layperson can see the signs of excess estrogen with this much accuracy, why can’t our doctors? Instead they most often totally ignore the root cause of the estrogen side of things when a female comes in for hormone related symptoms and issues. Their answer is either narcotics, surgery or synthetic hormones. All are a dead end road as far as resolving the issue. And, sadly, both carry not only short term side effects, but long term side effects. Far too many of our potential young mothers today suffer with miscarriage. While we like to think the miscarriage was “nature’s way”, in today’s world, it’s not. Miscarriage today is most often from low progesterone. Human progesterone is our making a baby hormone AND it’s our carrying a baby to term hormone. Progesterone in a female increases as much as 400 to 900 times when we become pregnant. 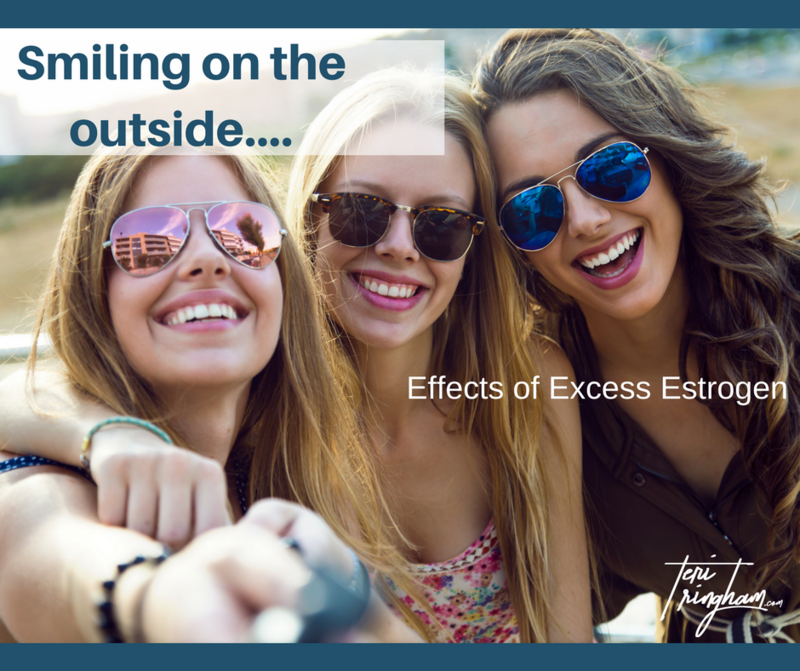 However, when we have excess estrogen, it interferes with our progesterone production. The heartbreak of miscarriage is happening far too often in our society. While some doctors have been informed by their pharmaceutical rep to recommend synthetic progesterone (see the discussion on why synthetic progesterone is not a good idea), this in no way resolves the issue of excess estrogen. It’s a band aid that might bring a baby into the world. But this fetus is being exposed to Momma’s excess estrogen throughout the pregnancy. And Momma, after the birth, will continue to struggle with hormone issues created from the excess estrogen. Thus, the far better solution is to stop the cause of the excess estrogen. What causes high estrogen? Chemicals (big-time). Fragrance is a huge culprit because most do not know fragrance is a chemical. Sadly, most of our females today grew up wrapped in blankets coated with fabric softener (sticky molecules in chemicals in fabric softener). They have bottles loaded with fragrance–shampoos, conditioners, lotions, hair spray used on their tiny bodies. They inhale air freshener from nasty plug ins or spray (think highly absorbable nasal membranes loaded with blood vessels to absorb the chemicals in these “fresheners”). When we discuss eliminating fragrance, our females do not like it. They resist it. They love fragrance. They are attracted to fragrance. And therein lies the rub. Getting rid of something a person loves–especially when they truly do not know it is disastrously affecting their hormones–is a major issue. That major issue is reflected in the female (and male) problems today. Certainly fragrance isn’t the only chemical in the aforementioned products. But I consider fragrance the most evil of all because it attracts our females-like sheep to slaughter-to these chemical laden products. So when I see a Facebook photos of three female friends doing a group shot–smiling for the camera–and all three are “padded”, I also fear their future: painful periods, potential infertility, cramping, fibroids and-once they are older–female cancers. Excess estrogen is, by far, no joke. If you do one-and only one-favor for your child, get the fragrance products out of your home…before baby is born. Because Momma is absorbing these same chemicals and affecting not only herself (think miscarriage) but also her unborn fetus. If it’s not safe, it wouldn’t be allowed in our products…right? We do not live in a clean, safe society. Chemicals are cheap and freely allowed in the United States. And they are widely accepted because we do not know better. Hence, cheap production means big profits for the manufacturer. Nobody is complaining or changing the laws regarding chemicals in our products so the manufacturer has no reason to change. To add to the issue, when we visit our doctor hoping for a solution to the pain and frustration, we do not have doctors warning us of the effects chemicals have on our bodies. Honestly, they don’t warn because the majority of them do not know. If you ask them, you will most likely get a response that ridicules the suggestion. Where to look for help with severe female hormone issues? But I ask you this…are you going to take the advice of someone who has yet to cure one single female with narcotics and synthetic hormones? Or are you going to look at the hundreds to thousands of research articles verifying the damage of fragrance and chemicals to hormone balance? Believe it or not, the very best place to look for help is with yourself. If I, as a common layperson could do it–you can do it (really!). The mindset your child-or yourself-is unique, too far gone or too severe in your/their hormone condition is a mindset that will cause you to give up before you even get started. If you believe you or your child cannot heal, you will continue on the current path. If your current path isn’t working–isn’t it time for a new one? Isn’t it time to trust you must look to the cause of these hormone issues rather than trying to resolve with pills or surgery? Because, honestly…unless you get to the source, you have no choice but to continue the current–likely very unsuccessful–treatment. As much as thinking of changes being a cure, think of them more as resolving a condition. Female hormone issues are often referred to as diseases. They are not. They are conditions. A condition was created in the body and a condition can be alleviated. That’s not to say you or your child might not be predisposed. Considering the number of mothers drinking from plastic water bottles and using fragranced products, it’s likely you or your child IS predisposed. This is all the more reason why the chemicals need to be eliminated. I have one child with all symptoms of Endometriosis alleviated. None of the answers came from standard doctor treatments. In fact, the damage from the current medical treatments was huge. The answers did, however, come from things our doctors either never mentioned or literally scoffed at when asked about the source. If, by chance, you get a doctor that suggests progesterone for alleviating painful cramping, miscarriage, fibroids or any of the excess estrogen conditions, the idea is right but the suggestion for a prescription synthetic hormone (known as progestins) is wrong. Synthetic progesterone is created in a lab with sticky molecules that attach to your cell receptors confusing the receptors and causing a different set of hormone issues. Studies show synthetic progesterone as a contributor to breast cancer. It’s in birth control pills. It’s in prescription medicines filled from a pharmacy. For those with extreme hormone issues, bioidentical progresterone–to help balance the excess estrogen–can be truly amazing. Bioidentical progesterone comes from a compounding pharmacy or apothecary (and, by the way, is in the crosshairs of the pharmaceutical companies since it replaces their synthetic progesterone). Do an internet search for a bioidentical doctor in your city or nearby. If you can’t find one, do a search for an apothecary or compounding pharmacy. Call them and as for the pharmacist. Ask him/her what doctors are using bioidentical progesterone. This is a great way to get started. While bioidentical progesterone can literally be a Godsend, it is not the long term solution. Let’s go full circle back to chemicals. If you use bioidentical progesterone (BP), but do not cut chemicals, the source of excess estrogen continues. Your BP can do wonders for awhile. But without removing excess estrogen, the BP will eventually be less and less effective. Use the BP to get relief. Use it to help balance or offset the excess estrogen. But make the ultimate goal to be removing the source of excess estrogen and eventually eliminating the need for BP. To do anything less, will be playing Russian roulette with your hormones. Because excess estrogen is almost always from chemically created estrogen mimickers called “xenoestrogens“.–as much as 10-100 times more powerful than natural estrogen. This is the reason for the powerful symptoms from excess estrogen. The human body cannot handle these xenoestrogens. To only use BP to balance without eliminating the cause of xenoestrogens leaves us exposed to the ramifications of these xenoestrogens. I discuss ways to address the powerful effect of xenoestrogens and the benefit of bioidentical progesterone in more depth in my book “Essential Gut & Hormone Wellness”. It’s somewhat of a curse that I look at smiling pictures of young women today and can’t help but be concerned whether they are truly happy. They should be happy. These should be some of the most carefree days of their lives. But their overall body “look” and the statistics on female hormone conditions predict differently. While this may seem a dismal prediction, the fact is…it IS dismal. Unless…. Yes, the result of today’s chemicals effects on our female hormone balance likely means a future of health struggles. But we don’t have to accept that prediction. If we are aware and if we look at our chemical exposure to remove them from our homes and our lives, we increase our odds of recovering balance. We can choose to brighten the future greatly by self educating and accepting that something that seems so simple–chemical exposure (including and especially fragrance)–does make a difference on our hormone balance. It is possible to help our hormone balance and give our females the right to enjoy life rather than “survive”. This help begins by emptying out all products with high chemical content from the home and in the personal hygiene closet. Being aware that chemicals are damaging is one thing. The next thing is playing the manufacturers game of “guess the chemical content” in our products. Manufacturers have a huge budget for their marketing departments to create beautiful, colorful, appealing bottles. They also pay them to be aware of trends in the market. The current trend is that people want more “natural” products. The marketing department knows this. Thus, the packaging often will have the word “natural”, “clean”, “fresh”, with essential oils”, “pure” and any other word that makes us think the product has no or low chemical content. However, plug most of these products into the Phone Apps of Think Dirty or EWG.orgs App called Healthy Living and you get the true picture. Scan your UPC code through these phone Apps and you will see a startling picture of many products-including those many of us consider safe. Removing chemicals isn’t everything-although removing them can make a huge difference. Another big factor is sugar and carbs on insulin-our master hormone that ultimately influences all other hormones (and entire body health). This involves diet changes …but that’s a topic for another day. Do you or someone you know struggle? There’s a whole lot of powerful info in this simple article. Share with someone you know who is struggling, Tag AND comment if you find this info helpful.